It is part of the JAI's mission to make accelerator science available and engaging to a general audience. We want people to know what big projects like the LHC are trying to achieve and why this is so interesting. We also want to show and perhaps surprise people with how particle accelerators are much more common than one might think. In fact there are accelerators everywhere filling a diverse range of applications, some quite separate to physics. Such as in art where accelerators can be used to determine the techniques a painter used to produce a painting and even detect forgeries! Particle accelerators for humanity - dive into a world of particle accelerators beyond just particle physics. Accelerate! 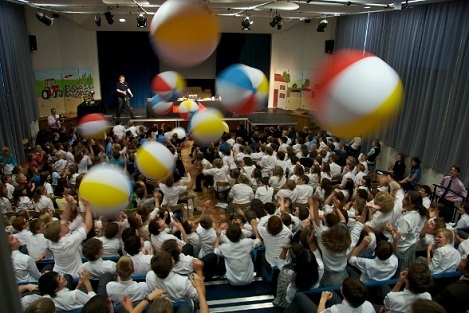 - A unique and exciting show for school kids that tours the country explaining how accelerators work using beach balls, liquid nitrogen and huge fireballs! Oxford May Music Festival - An annual music festival with a twist. It combines music concerts with a programme of (mainly scientific) lectures to explore the cross-over between the two. Posters for Schools - A selection of free posters from the Oxford Physics Department. Including one about accelerators. Appeal - An event for A-Level Physics teachers to explain what goes on at the LHC and other such accelerators.